Oh my — they have a 6″ leather covered heel with a 2″ acrylic platform (roughly a 4″ heel) all neatly tied together with chiffon straps. I swear — these are the most impractical shoes ever made. I can’t wear them to work for obvious reasons. I can’t wear them out because they’ll get dirty. Nonetheless, I must have them!!! Surely I was drinking lots of champagne at my house at the time because I immediately called the Fendi store at the Galleria to see if our podunk town would get any for me to see and (the terrible question) how much do they cost? Answers to horrible terrible practical questions: $1200. And they only made 30 pairs in each size, which of course makes them that more desirable. Do I want to pre-order so I am sure to get the pair I want? <Sigh> I had to let go of my Cinderella story. What? 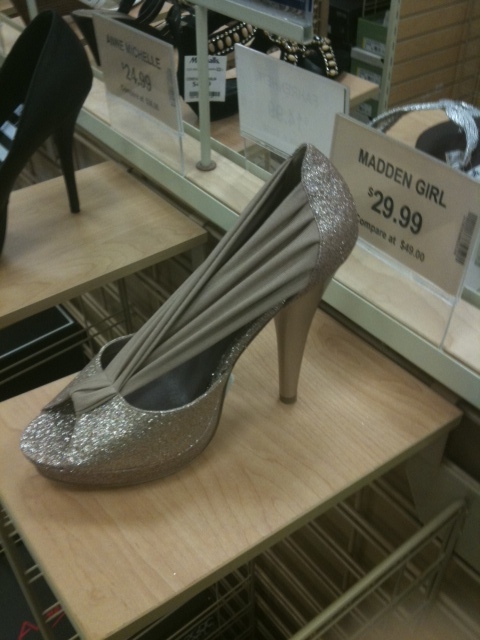 This is a Steve Madden Girl rip-off of my happily ever after shoe? Unforgivable. My ethereal platforms have been replaced by cheap glitter? The delicate shape of my stiletto was recognized as a walking hazard and replaced with a v-shaped stump? Outrage!! And though the $29.99 price tag is much more in alignment with my always dwindling checking account — please please — give me Fendi or give me death on this one and not because I am philosophically opposed to knock-offs. I have the best knock-off Jimmy Choo bag ever created. I just think if you’re going to fake it, you should fake it well. Readers — This is a great reminder that some shoes are better online and in your dreams than at Marshalls and then your closet. Hope you dream of Fendi shoes at Marshall’s prices. Prev Chicks in sports ROCK! Aw, I think the Marshall’s shoe is cute! Ick! And you’d be finding that cheapo glitter all over the place for months. FAIL! Not a fan of the Marshall’s version!